PokerAceHud (PAH) is a software that works closely with PokerTracker. PokerAceHud consults the database PokerTracker (PT) and fits over your poker tables the statistics of players sitting at your table in real time. PokerAceHud (PAH) is a software that works closely with PokerTracker. PokerAceHud consults the database PokerTracker (PT) and fits over your poker tables the statistics of players sitting at your table in real time. For example, the image above, all players have statistics in PokerTracker. These statistics are displayed on the table to help you make better decisions when you play against these players. PAH is completely legal on all poker sites supported. It is legal because the statistics you see are statistics that you have accumulated by playing against the players in question. Having a pen and paper, you could record the same information. Which is illegal in some software is that information is shared between all users of the software. PAH only read the statistics you yourself accumulated over time. It is not on the list of banned any website software. So you can use it without fear. Why use PAH? The question is "why not use it?" PAH is a great help when you play online. If you know a player raises 30% of its pre-flop hands will respect you as much as its reminders of a player who raises 2% of his hands? If you know a player bets 100% of rotating, will you sleep as easily as if the player put in 10%. If the player check-raise 75% of the time on the river, you'll also often bet after he checked on the river that you would have done after a player who check-raise 2% of the time? Obviously you need to pay attention to statistics. A player recounted recently on the forum after one of its preflop raises, a player told him, "I have 37 hands on you in PAH, this is the first time you reminders ... you must have AA or KK." Résonnement this is totally wrong. It is impossible to determine as precisely the style of a player after 40 hands. It is simply impossible. After 40 hands can certainly have an idea, but it is only a vague representation of the playing style of the player. That is why it is ESSENTIAL to have the number of hands played in the statistics on the table (the blue number on the illustration above). Looking at the statistics of the players and the cumulative number of hands, you get an idea of ​​the validity or otherwise of statistics. Also, if you have any statistics on a player, do not tell her not as a player did! This is the worst thing to do! One could talk for hours adjusting our game compared to statistics of our opponents. This may be a subsequent article. Rather, this article focuses on the technical aspects of PAH. This first section on PokerAceHud focuses on software configurations. The next article will focus entirely on the "layout manager". Namely, that each statistic represents, how to change their configurations and their location, how to use the pop up PAH, etc.. Unfortunately, PAH is not compatible with all sites. By cons, it is compatible with most supported by PT (PokerTracker) sites. PAH is not free. You can get it for the modest sum of $ 25. A trial version is available and it is functional for 30 days. I invite you to download it to be able to follow the instructions below as and when you read the article. First, PAH can not function without PokerTracker. 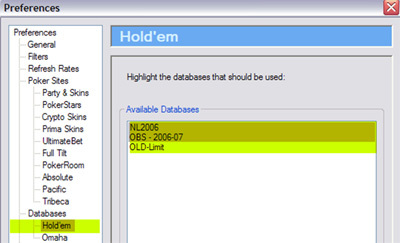 Make sure that PokerTracker is functional and correctly imports hands before installing PAH. Before PAH can not display data, you must also specify the data bases of PT PAH should consult. To do this, in the menu of PAH (top of the main window), go to options >> preferences. 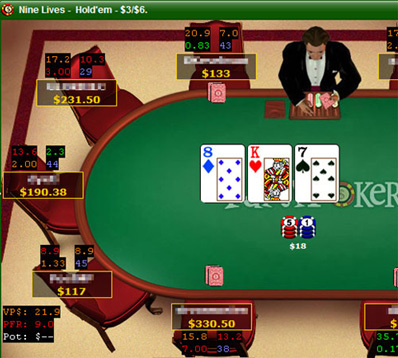 Click the "Hold'em" option in the left menu as shown in the following image. In the right section, highlight all the database that will be accessible by PAH. To select more than one database, press CTRL while clicking on the second database key. For example, if you have an old PT data base date of 1 year, it is not necessary to select here. You may not see the same player at all, and if by luck you Review, their style of play will surely changed a lot. Exclude this database you will alleviate your computer resources that PAH used. For PAH can recognize the active tables, you must also configure the DAP for each site on which you play. The configurations of each site varies slightly, but these configurations are relatively easily. In the left menu, click the site you play mainly and specify the directory where is the "hand histories" of the poker site. 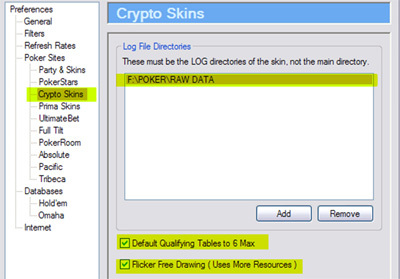 For example, the image above, I specified that my "hand histories" for Crypto network sites were in the directory F: \ POKER \ RAW DATA. Add or remove directories as needed with "add" and "remove" buttons. You must do this for all the sites where you play. Certain enabled sites will not be listed here. Is that they are part of networks. For example, Sun Poker and InterPoker are both parties 'Crypto' networks. It is this network that you have selected here. Click here to see the major networks and the sites they include. You will also notice two options at the bottom of the window. If you play on tables 6 players mainly, check the first option. PAH does not always recognize itself tables 6 or 10 players. If this is the case, you will see that the statistics do not put in the right place on the table. To rectify the situation, you have to click with the right button of the mouse on one of the tables in the main window (image below) and select the correct table type in the shortcut menu. To ensure that PAH always displays statistics in the right way according to the type of table you are playing, check or uncheck the option. That will save you from having to manually specify for each table when you play. The other option, Flicker Free Drawing is more technical. On some sites, the statistics tend to blink when hands end. Flickering for a while then reappear correctly. Obviously this is not desirable and can be very distracting. Select the second option to avoid flicker. However, prevent the flicker will be asking for your computer. If you see that PAH is too slow on your computer, uncheck the option. By cons, unless your computer is 10 years old, you should not have performance problems, even if this option is checked. Here! PAH should be functional. You can already try it on your favorite poker site or continue reading for a description of additional optional configurations. Comments or questions about the aspects covered in this tutorial?